Scientists already had little doubt that there was, at one point, liquid water on Mars, thanks to tiny spherical deposits discovered by the Opportunity rover in 2004 and the comprehensive mineralogy studies conducted by the Curiosity rover. The evidence suggests that vast lakes and rivers dominated the surface of Mars billions of years ago. What's more, tantalizing clues have continued to imply the existence of liquid water on Mars today. Condensation was measured on the Phoenix lander in 2009, and dark streaks spotted on Martian dunes may be evidence of briny water (although more recent examination suggests they could be avalanches of dry sand). This new discovery of a subterranean water deposit, outlined in a new paper in Science, suggests water is indeed underneath the red sands of Mars. Perhaps the Red Planet even has entire subsurface lake systems like those beneath Antarctica. Mars Express is a European Space Agency probe that has been orbiting the fourth planet from the sun since December 2003. A year and a half after it arrived, the craft deployed two 20-meter radar booms, forming a 40-meter antenna. The Mars Advanced Radar for Subsurface and Ionosphere Sounding (MARSIS) instrument came online. Since then, MARSIS has been studying Mars with radar signals to learn more about the planet's interior structure and composition. The Mars Express spacecraft with its 40-meter MARSIS antenna deployed. In 2007, the instrument detected something interesting. Near the Mars southern polar ice cap, it found strong reflections of radar signals—differences between two layers known as echoes. Strong echoes imply a big difference in what's called dielectric permittivity. "In the case of Mars, and also in the case of Earth, liquid water is the material that certainly would produce the strongest reflections," says Roberto Orosei, a co-investigator of the MARSIS instrument at the University of Bologna in Italy and lead author of the new study. The strong radar echoes in 2007 wound up being the result of a layer of icy carbon dioxide on the surface of Mars rather than liquid water beneath. "CO2 ice is very transparent and is able to let the radar pulse penetrate into the ice much better than pure water ice," Orosei says, which is why it mimicked the signal one would expect from underground liquid water. However, he says, many believed the CO2 conclusions "were not the end of the story." Continued observations proved difficult. "The real problem was that observations over the same place in different moments would reveal different results," Orosei says. "So we would see a bright reflection on a certain area one day, and then we would fly over the same area maybe a week later, a month later... and we would not see the same strong reflection we would see ordinarily." Finally, the MARSIS engineers figured out what was thwarting their observations. It was the way their own spacecraft processed the data. "The radar by itself will produce a very high amount of data... [so] it’s necessary to sum together many pulses, more than 100 at a time," Orosei says. This method of averaging the information meant that sometimes the data contained a small, high reflectivity area, while other times it had mysteriously disappeared. "It was something that would really be frustrating in hindsight because we were of course spending years and years debating the possible causes, when in fact the solution really was to change the processing scheme of the spacecraft," Orosei says. Artistic impression of the Mars Express spacecraft probing the southern hemisphere of Mars,superimposed to a color mosaic of a portion of Planum Australe. The study area is highlighted using a THEMIS IR image mosaic. Subsurface echo power is color coded and deep blue corresponds to the strongest reflections, which are interpreted as being caused by the presence of water. Even after this breakthrough, the team spent years taking more observations of the south pole region. Mars Express does not repeat the exact same orbit of Mars, meaning long gaps of time can separate flights over the same area. In addition, the team could gather useful observations only at low altitudes and when the spacecraft was on the night side of Mars because the sun excites the ionosphere of the planet, which blocks radar signals. In total, it took three and a half years to obtain 29 observations of the target location. The scientist who designed MARSIS and who remained most adamant that the signals pointed to a subglacial lake, Giovanni Picardi, passed away during those years. "Professor Picardi... died in 2015, just a few months away from the completion of the data acquisition above the area. So it was really tragic that he could not live to see the end of this work," Orosei says. 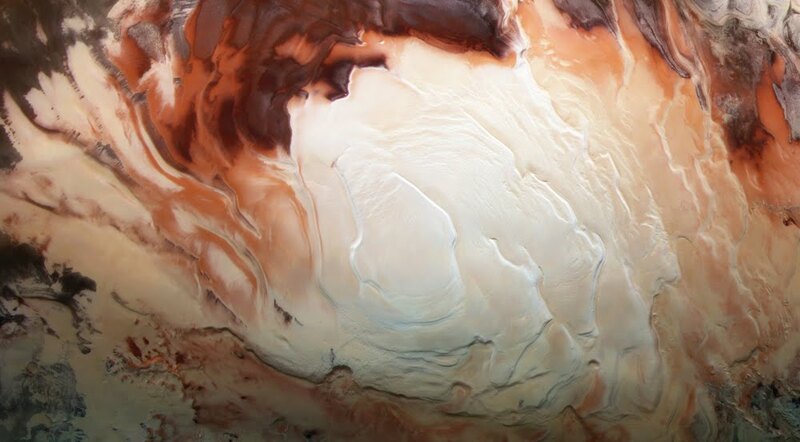 Even if Picardi wasn't there to see, the MARSIS team realized his dream and revealed a frigid reservoir of liquid water beneath the southern polar ice cap of Mars. The implications for complex systems of subsurface lakes could revitalize the debate about whether microorganisms could exist beneath the surface of Mars to this very day. "It was a long march, a sort of long march through the desert, and we are finally out of it," Orosei says. "It’s like a dark cloud has gone away." The study says the subglacial lake on Mars is cold indeed, and rather salty. Water ice that is near the melting point is opaque to radio waves, and so the ice above the lake must be well below freezing. Accordingly, the subglacial water must be at least negative 10 degrees Celsius. Artistic impression of the Mars Express spacecraft probing the southern hemisphere of Mars, superimposed on a radar cross section of the southern polar layered deposits. The radar cross section has been tilted 90°. The leftmost white line is the surface radar echo, while the light bluespots along the basal radar echo highlight areas of very high reflectivity, interpreted as being caused by the presence of water. For this to be possible, the reservoir must be saturated with salts—likely salts of sodium, magnesium, and calcium, which have been discovered on the Martian surface. These salts can reduce the melting point of water to negative 74 degrees C, so the subglacial lake is likely between this temperature and around negative 10 or 20 degrees. "From what I think we have learned about this subglacial lake, the most likely analogue for this environment is the subglacial lake that was recently discovered in Canada... in which the lake itself is in contact with a deposit of salt, and so it is very very salty," Orosei says. The most intriguing possibility is that this Martian lake is not alone, but rather part of an extensive network expanding across the south polar region of Mars. “Data provide some hints that this single lake is not a unique finding," Orosei says. "We do see bright spots in other areas." MARSIS, however, does not have the technological capability to look for channels or rivers connecting a system of lakes. "It would be a very different story if this was just an isolated patch of water produced by some thermal anomaly in the crust, let’s say, or if indeed the conditions under the polar caps are such that you have a fully connected hydraulic system like you have in Antarctica, in which most of the subglacial lakes are connected to each other so that material, and even life, potentially, could move from place to place," Orosei says. But before we envision such a thing, follow-up observations must confirm that this one lake really does exist. Because for all the exciting data that has been obtained by MARSIS, there is one major problem: Another radar orbiting Mars, the Shallow Radar (SHARAD) on NASA's Mars Reconnaissance Orbiter (MRO), has not been able to detect the underground reservoir at all. "The problem is SHARAD is operating at a much higher frequency, and we were almost shocked to discovered that SHARAD was seeing absolutely nothing on the areas in which we were seeing the bright reflections with MARSIS," Orosei says. The MARSIS team believes that irregularities on the surface of the southern polar ice cap could scatter the radar signals of SHARAD, which operate at 20 megahertz compared to four or five megahertz for MARSIS, preventing it from seeing the reservoir of water. An image of Mars taken with the Hubble Space Telescope. The southern polar ice cap is clearly visible on the planet, stretching for hundreds of kilometers. Daniel Nunes, the Instrument Scientist for SHARAD with NASA's Jet Propulsion Laboratory who did not participate in the new study, confirms that SHARAD has had trouble mapping the southern polar ice cap of Mars. "There's something intrinsic in the southern polar cap that causes the SHARAD signal to see not as deeply as it does in the northern polar cap," Nunes told Popular Mechanics. "And as a result, we don't see with SHARAD that interface between the ice and the underlying surface. So if there is a lake there, SHARAD wouldn't see it." However, Nunes also cautions that scrutiny of the MARSIS team's findings is required before we can make any hard and fast conclusions. "I think there's going to be a healthy debate on whether this interpretation is correct," Nunes says. "One thing that we need to be also cautious about is that there are different kinds of materials that can produce large reflections as well... [and] I think the new processing has to withstand verification by the community," he says, referring to the MARSIS team's new data processing to remove errors from averaging. Regardless, Nunes says that the MARSIS team's findings are "a very exciting development." A new Mars orbiter in the works might be able to solve the mystery. The 2020 Chinese Mars Mission will carry a radar sounding instrument that will operate in between the frequencies of MARSIS and SHARAD. If this Chinese mission also spots radar reflections that indicate a subglacial lake in the same location as MARSIS, the implications for possible water ecosystems beneath the surface of Mars will be profound.